The chance of being claimed against is now a major risk factor for every building designer, engineer, quantity surveyor and project manager. Apart from the cases that go to court, many other claims are settled before they reach that stage. The cost of insurance to meet claims is now a substantial component of every practice's overheads. Sensible risk management can identify the potential sources of claims, reduce their likelihood, warn of impending trouble and control how the claim is to be defended. This book explains how to plan a risk management strategy and suggests techniques that can supplement the practice's existing management procedures without imposing unnecessary bureaucracy. It attaches as much importance to the interaction of risk between members of the design team as to the risk profile of the practice itself. The first part defines risk and its origins, discusses how risk can arise in the various professions and types of practice, and how it interacts between the professions, compares quality assurance with risk management, and advises on the relations between the practice, its insurers and its lawyers. It concludes with advice on how to create a risk strategy and system for the office. The second part is devoted to techniques and covers: setting up the appointment; creation of the team; managing the project; the risks of CDM; the complications of procurement; and drafting, awarding and administering the building contract. Risk implications of the major contract forms are discussed in detail. It concludes with advice on the handling of claims. The book contains references to a number of legal cases to illustrate the risks discussed. 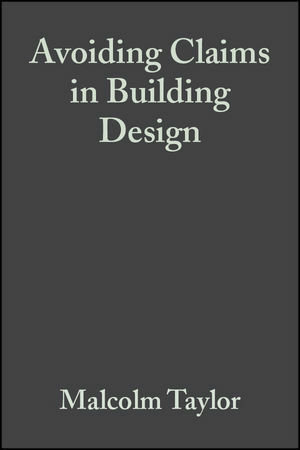 It is recommended reading not only for the individual professions (architect, engineer, QS, project manger), but for all of them collectively in understanding how the risk of one profession can become the risk of any of his fellow team members. Malcolm Taylor FRICS was a partner in Building Design Partnership responsible for co-ordination of quality in practice operation including professional indemnity matters, terms of engagement and building contracts. He led the team which introduced a quality management system and obtained ISO 9001 certification. He has lectured and written widely on management systems for construction professionals, including contractual and quality assurance aspects. Introduction: Part 1 - Principles and Practice of Risk Management; Defining and identifying risk; Risk anatomy of practice; A view of the professions; Their risk patterns;. * Author has excellent experience as a former partner of a major firm of architects (BDP) and consultant to professional indemnity insurers acting for most of the large architectural practices.